A power bank that’s designed with your Apple Watch in mind is a very useful thing indeed—especially if you’re powering using its features or traveling—as you can top up on the go. Here’s a look at the best power banks with Apple Watch charging functionality in mind. Now, we know what you’re thinking—just use a regular power bank and plug in the Apple Watch USB cable, right? Sure, you can do that but these are more convenient options. 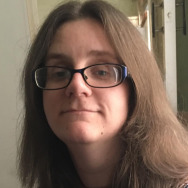 This can be because they offer a solution that doesn’t involve you carrying extra cables, but also because they offer some kind of extra feature that you don’t necessarily get with a regular power bank. There’s something for every taste here. Let’s take a look at the best power banks for charging your Apple Watch. Ideal for charging all your gadgets from Apple Watches to iPhones and other smartphones, the UGREEN Portable Wireless Charger offers a slim and functional profile. About the same length as the average smartphone, it’s easy to store in your bag for when you need some extra power. There’s a USB socket for plugging in devices along with the important magnetic puck for charging up your Apple Watch. Its 2200mAh capacity means you can simultaneously charge an Apple Watch and iPhone once which will give you time to get to a outlet later in the day. A simple key chain device, the Griffin Travel Power Bank for Apple Watch slots onto your keyring ready for when you need some extra power. 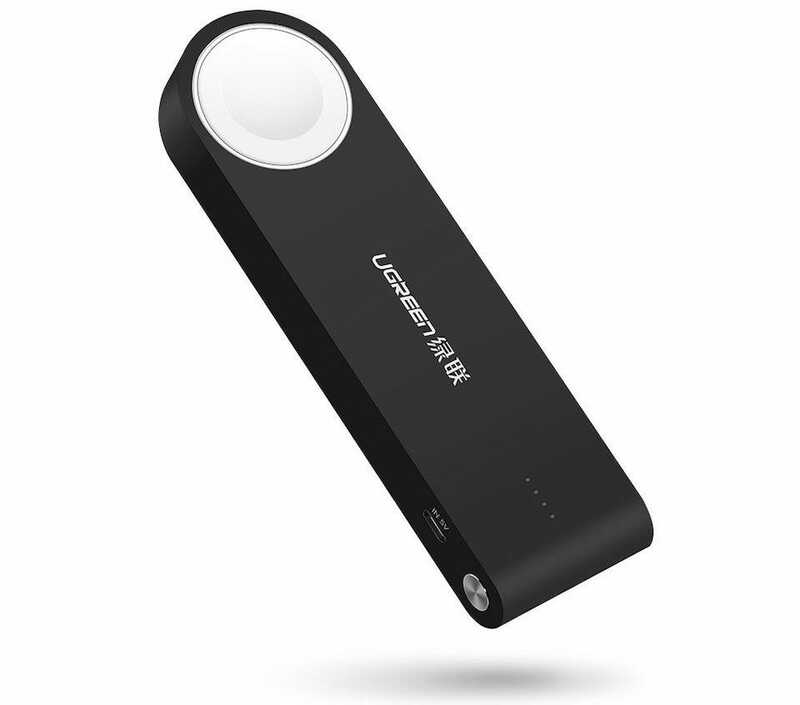 The 1050mAh capacity ensures you can get 2.5 full charges for your wearable, before needing to recharge at a power point. The magnetic charging surface is built into the battery so it’s a neat and sleek unit. There’s no need to carry extra cables, and it blends into your equipment well. Griffin has kept things suitably simple here, and it shows—you’ll appreciate having a charger that just works with minimal hassle. You need to supply your own cable but the Smatree Charging Case for Apple Watch is a very neat idea. 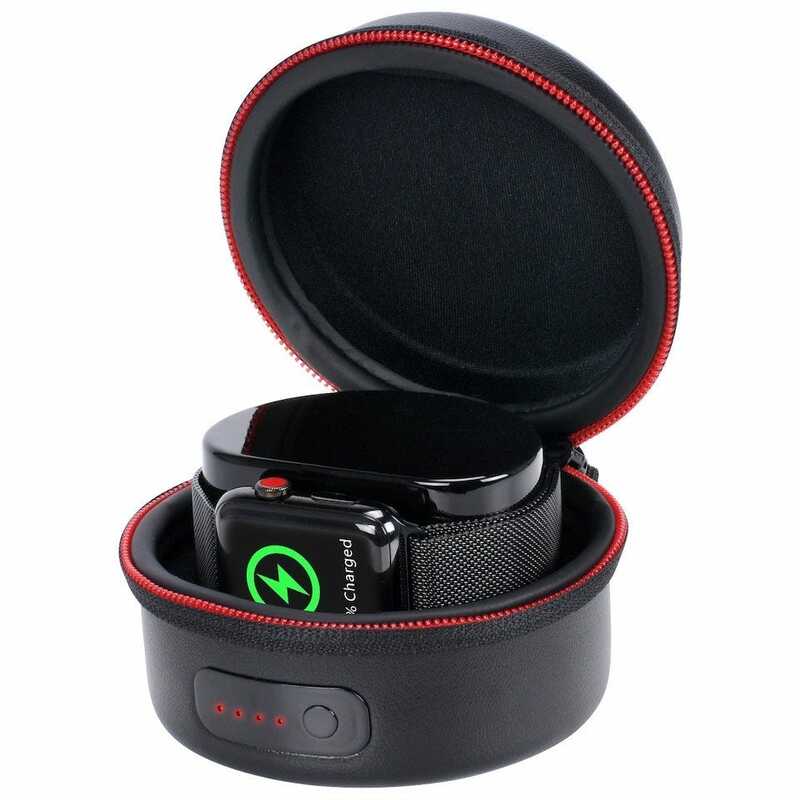 Simply place your Apple Watch inside the case (hooked up to the magnetic puck, of course) and your wearable will charge up while protected inside the zipped up case. 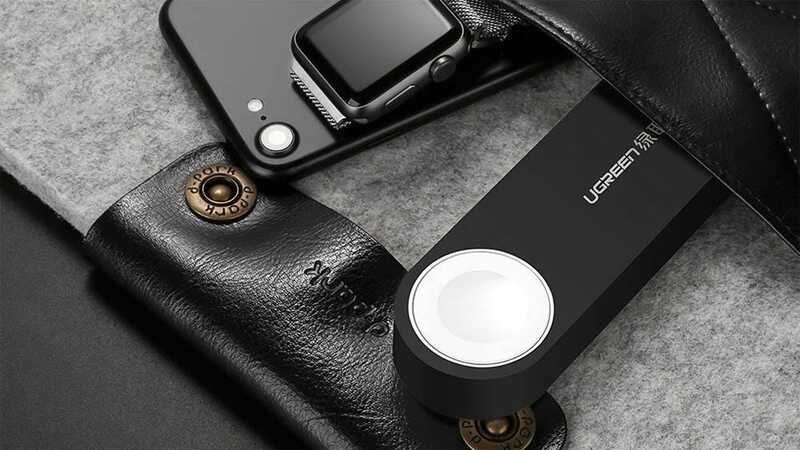 Such extra safety means you can easily toss it into your bag and leave it to do its thing without worrying about your Apple Watch getting jostled around. Combining storage and charging is a great idea, and it works brilliantly here. A 3000 mAh capacity means you can charge your Apple Watch between 4 and 6 times before you need to find a power source too, so it’s super useful when traveling. If a high capacity battery is essential for you then you need to buy the MIPOW Portable Apple Watch Charger. With 6000mAh to play with, you can fully charge your Apple Watch 10 times, or an iPhone XS or similar phone 2 times. It’ll easily charge an iPad fully once too. Design wise, the MIPOW charger has a 45-degree tilt stand so you can easily place your Apple Watch on the magnetic puck on the top of it, as well as plug in an iPhone or other smartphone to the side via a USB cable. Its flat surface means it’ll easily rest on your desk or nightstand, and it’s small enough to put in your bag or some pockets. It’s pricey but versatile. 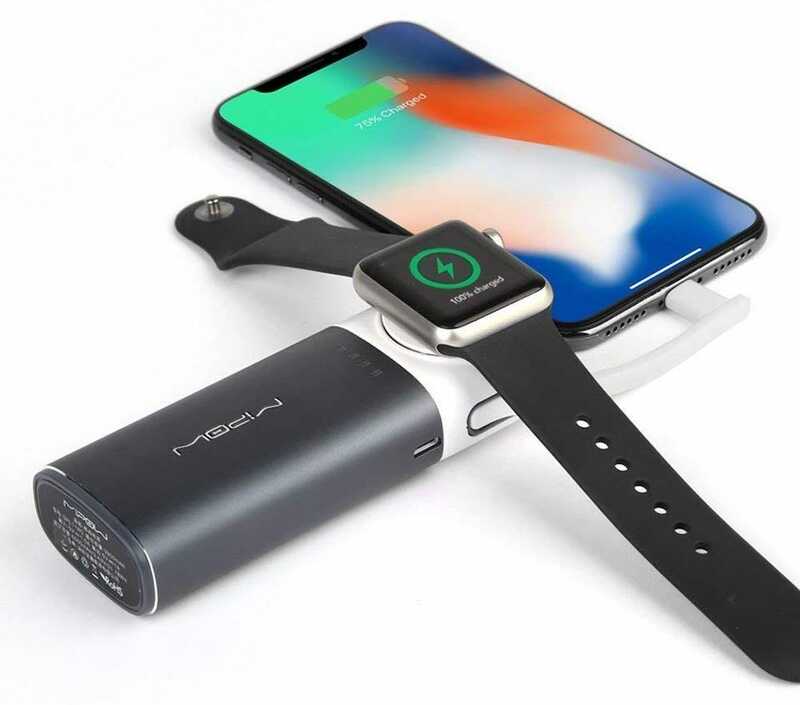 We’ve featured a lot of practical battery banks for the Apple Watch and, well, the CHOETECH Apple Watch Charger isn’t exactly practical, but it definitely serves a use but niche purpose. It’s a metallic colored stand that your Apple Watch rests on top of when charging. It’s angled in a way that means you can easily look at your Watch while it charges, and it means your Watch will automatically enter Nightstand Mode, proving useful at night. Alongside that, you can plug in a smartphone via one of the stand’s two USB sockets, and simultaneously charge your devices. If power outages or issues are a thing where you live and you hate starting the day with a dead or nearly dead Apple Watch, the internal battery will ensure this stand charges your watch even if you lose power in the middle of the night. However, the battery capacity is pretty low. It’s only 600mAh so we’d recommend you stick to using it for your Apple Watch only. Also, the stand might look great standing up but, weirdly, you can’t fold it down. That means it’s not ideal for travel purposes. 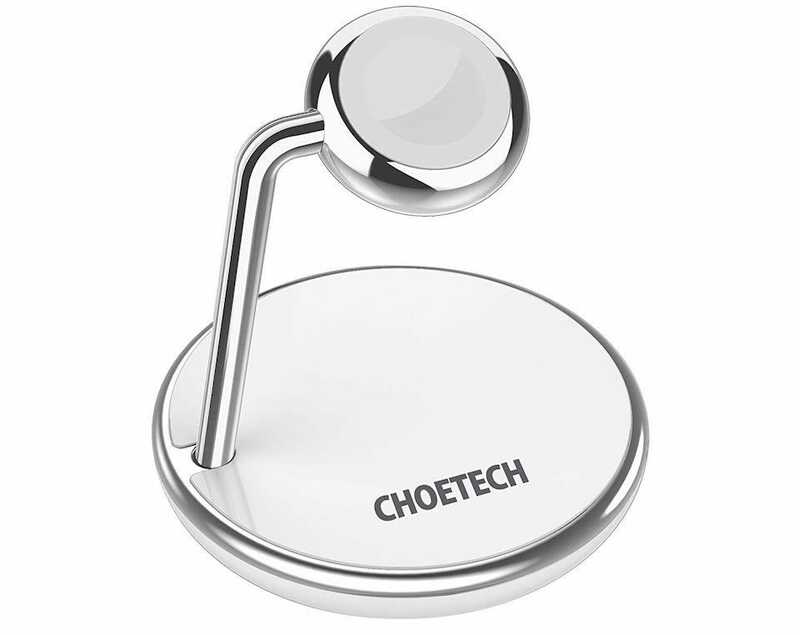 However, if you just need something to tide you over and that looks good, there’s something pretty charming about the flawed yet stylish CHOETECH Apple Watch Charger. Wish your current desk was a standing desk but you don’t want to (or can’t) replace it? While adjustable desks are great, you don’t need to buy one to get the benefits. There are plenty of desk converters out there, and we’ve looked at the best ones.